Queen Da Muddermark asked Challenge Constable Chauncy to help her and Inspector Clueso to not only help solve the mystery of who killed Old Man Boddy at Tudor Mansion, but to also keep track of all the tea partiers so that they don’t get into mischief or trouble themselves. As you can see from the highlighted words, Constable Chauncy has already solved this murder mystery and is offering up clues to the tea partiers as to how Old Man Boddy was murdered. Can you figure out Who done it? How they done it? And Where they done it in this puzzle? 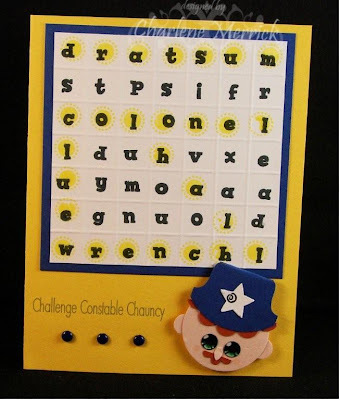 Keep a lookout in the future for Challenge Constable Chauncy. He’s also been hired as the official Challenge Policeman to make sure all are in compliance with challenge requirements. There’s a buzzer waiting on the inside for all who are in noncompliance. Chauncy is made of various punches: 1 3/8 circle for his head, ¼” for his eyes, scallop for his hair, boho blossoms for his mustache, leaf flower punch for his nose, round tab for his hat, and star. I colored his eyes with a white gel pen and then used a green Copic marker over the white gel pen to color his eyes. He is popped up on dimensionals. For the Find a Word puzzle, I cut a 3 ½” x 3 ½” piece of white cardstock and used my Scor Pal to score it at every ½” mark both ways. I used a small Studio G alphabet stamp set to create my words. Clue words are highlighted in YoYo Yellow with a portion of one of the Seeing Spots stamps. I hope you can join us at Tudor Mansion for a spot of tea and some mystery today! You can get the deets at Queen Da Muddermark’s blog. What a great card...love the background and your focal image is crafted so neatly....very creative. Holy Cannoli!! You are SOOOO clever and creative! LOVE this Charlene! Bertie...me tinks u bin hangin owt wid da Muddermark two much......u r tellin' da storees two whell...and da cardz u mak r jus to clevr 4 me...tanks 4 sharin' ur talentz wid da res' u uz. Well, duh!! Now that is a word in your puzzle...it was a secret hidden word that I'm thinkin was just for me...that's what I get for not playin today. but I am no good at punches and scenes and all that so I have to be entertained by you and Cindy...and boy am I!! Who is Colonel Dratsum anyways?? and Traci, you and me both girlfriend, what the heck is a dratsum???? You never did answer my question Bertie! Jojot was a school teacher???? How creative and fun Charlene!! What a clever idea!! And I think I have it all figured out too. I won't say anything and spoil it for the others though. hee hee Uhoh.... the challenge police.. Now I know they do exist. Very creative and fun! SO SO CUTE AND CLEVER!